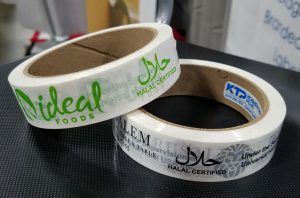 KTP now offers custom-printed specialty halal tape! Along with our other varieties of tape and sealing products, we now offer tape printed with halal certification symbols. Similar to kosher, it is important for people who keep halal to know whether their meal is safe to eat. Use this clearly printed tape to indicate halal items while ensuring that they stay securely sealed in transit or storage. Plus, send us your artwork and have your tape custom-printed with your company logo and information. Advertise your business, keep food sealed and mark halal items all with one great product! Choose from a variety of standard colors, sizes and materials.